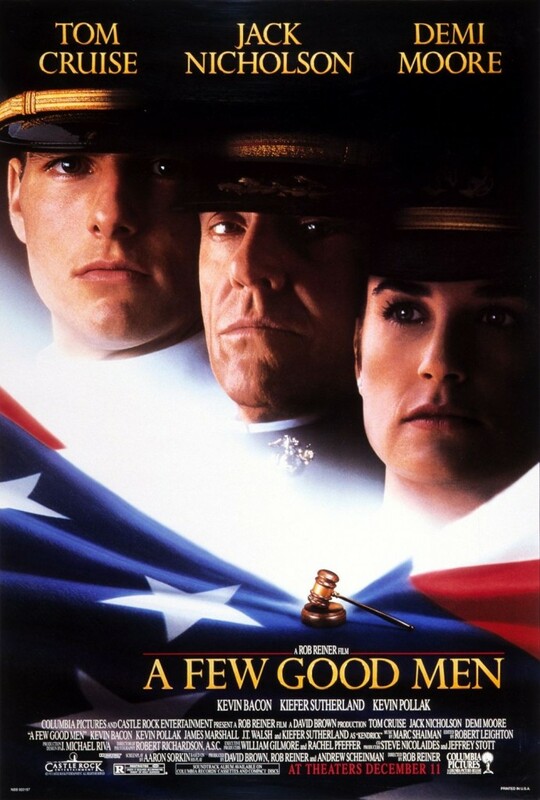 Twenty years ago tomorrow, on December 11, 1992, the popular legal drama A Few Good Men saw its release in theaters. Written by Aaron Sorkin (and based on his play), and directed by Rob Reiner, the film has become ingrained in our culture, spawning memorable lines (“You can’t handle the truth”) and scenes (“How did you know where the mess hall was if it’s not in this book?”). Further, the film assembled a host of Hollywood megastars (Tom Cruise, Jack Nicholson, and Demi Moore), all of whom were super popular at the time. As a courtroom film, it has a special place in the hearts and minds of lawyers. We here at Abnormal Use have always been fans of this movie, so we decided to commemorate its twentieth anniversary with a full week’s worth of coverage. As you may recall, in March, we did something very similar with My Cousin Vinny to celebrate its twentieth anniversary. So, for this film, we’ve also gone all out. This week, we’ll be posting our own thoughts and memories of the film, an interview with one of the actors, and other related content. “Can You Handle The Truth?” – Our writer Rob Green analyzes the most famous scene in the film and wonders if Tom Cruise’s character actually employed good legal strategy. “A Few Good Men: A Former JAG Officer’s Perspective” – A former JAG officer, Rob Green takes a look at the film to determine how accurately it depicted the military justice system. Spoiler alert: He finds that the filmmakers got some things right, and some things wrong. “Abnormal Interviews: Actor James Marshall” – We were fortunate enough to score an interview with James Marshall, the actor who played Pfc. Louden Downey, one of the defendants on trial. Marshall shares his memories of the filming experience and working with Tom Cruise, Demi Moore, and of course, Jack Nicholson. “Friday Links: A Few Good Men Edition” – We’ve cobbled together some interesting links to commentary on the film and its place in history. We hope you enjoy our anniversary celebration. As the days proceed, we will activate the links to this content above.